– A historic record recorded just four years removed from the dawn of the analog tape era! – 200-gram double LP set remastered by Ryan K. Smith at Sterling Sound from the original analog tapes and cut at 45 RPM! – Plated and pressed at Quality Record Pressings! “…while the 33 was a startler, the new (45 RPM) version — spread out on two LPs, to accommodate the wider grooves — will leave you breathless. There’s more sparkle to Ellington’s piano, more wood in Wendell Marshall’s bass, more breath and reed and romance in Johnny Hodges’ alto sax, more force in Jimmy Hamilton’s hard-blown clarinet. Each player in the horn sections sounds more distinct; I hear more of Duke’s playing, underneath those sections, too. And soloists — palpable enough in 33 1/3 RPM — are holographic at 45. In short, the 45 lets us hear more of the music, more of the detail, more of the human presence; it transports us more completely back in time.” — Fred Kaplan, Stereophile.com, June 17, 2017. Read the whole review here. Named a 2015 Record To Die For by Stereophile magazine. “Remastered by Ryan Smith at Sterling Sound from the original analog tapes, the record was plated and pressed at Quality Record Pressings. The depth and space when those rich chromatic harmonies create a wide and well-defined soundscape, the timbre of the orchestra as a whole as well as individual instruments, and the thick, wooden sound of Wendell Marshall’s bass are among the aural pleasures provided when you drop a needle on this platter; expect goose bumps.” — Music = 5/5; Sonics = 4.5/5 – Jeff Wilson, The Absolute Sound, May-June 2015. “I chose the CD reissue of this album as one of my R2D4s for 2012, but now from Chad Kassem’s Analogue Productions comes this QRP LP, and it’s an occasion for popping corks. Released in 1950, this was Ellington’s first LP, and he used the new medium to stretch out four of his biggest hits. The arrangements are jaw-droppingly gorgeous and the sound just slightly less so. Recorded by Fred Plaut, who later miked Kind of Blue and other Columbia classics, it has the dynamics, depth, and in-your-face tonal realism of a modern (mono) audiophile thumper. Among the best jazz albums ever. How about a 45rpm pressing, Chad?” — Fred Kaplan, for Stereophile – “Records To Die For” – February 2015. “Among the first recordings arranged and produced to take advantage of the LP’s longer playing time, this album was released in 1950 on Columbia Records’ classical imprint, Masterworks, with a whimsical cover by Stan Fraydas (author of Hoppy, the Curious Kangaroo) that’s reproduced for this edition. (Columbia soon replaced it with an image more “modern” and more mundane. )… Freed from the 78rpm single’s three-minute constraint, Ellington could score and record concert-length arrangements similar to those enjoyed by his concert audiences. Three of the four selections, including ‘Mood Indigo’ and ‘Sophisticated Lady,’ are familiar Ellington classics stretched and elasticized to luxurious effect. The harmonically saturated, transparent mono sound is astonishing for any era of recording. It’s sure to leave you swooning, and wondering how and why recorded sound has since gone so far south.” — Michael Fremer, for Stereophile – “Records To Die For” – February 2015. “This new re-issue slays my vintage copy in every way. Every dimension of the recording was much better…dynamics, harmonics, frequency response, detail, jump…all just leaped out at me! The recording sounded like it had been made that morning…absolutely fresh-sounding. No veiling. No roll-off. In fact, it’s so good that it doesn’t matter that this is a mono recording! Listen to it on a great turntable…you’ll hear mono that fools you into thinking that it’s not mono. Just wait until you hear Yvonne Lanauze sing, “Mood Indigo” amigos, after a long instrumental build-up…she’ll take you there! … The pressing itself was impeccable: flat, and free of noise, tics and pops…a genuine masterpiece of the pressing-plant arts. The Hyperion OCL, the finest cartridge that I’ve ever heard, revealed how superbly these grooves were carved! Commendable, reference-grade analog…very, very close to master tape sound. Very damned close! Kissing cousins close! Hell, maybe even closer than that. In fact, I now consider the Analogue Productions re-issue of Masterpieces by Ellington to be one of the very finest Jazz records ever released. (Sorry Miles! Move over, Kind of Blue! ).” — David W. Robinson, editor-in-chief, Positive Feedback Online. “Most highly recommended (the record is now on the QRP presses). It’s one of my ‘Records to Die For’ in the February 2015 Stereophile. You won’t have to die to get a copy. $30 will do and it’s well worth the money. A true classic both musically and sonically and a historical work of art you can now own.” — Music = 11/11; Sound = 11/11 — Michael Fremer, AnalogPlanet.com. Read the whole review here. “The best album ever made by Duke Ellington, which is to say, one of the best albums in jazz — is also one of his least known. … now, a leading audiophile record label, Analogue Productions of Salina, Kansas, has brought it out on pristine vinyl (it’s also, despite its vintage, one of the best-sounding jazz albums ever), and the time has come to take notice. … the new, remastered Analogue Productions LP, which is to the CD as a high-def television is to a circa-1980 Trinitron. Played on a good sound system, it’s a sonic time machine, hurling you into Columbia’s 30th Street Studio with the Ellington orchestra. Horns sound brassy, drums smack, cymbals sizzle, you hear the air pass through the woodwinds. When saxophones play in harmony, the overtones bloom like a sonic bouquet; when the musicians take a quarter-note pause, you hear them breathe in.” — Fred Kaplan, Slate, Dec. 9, 2014 Read the whole review here. Masterpieces By Ellington shines from an astonishingly brief period of history that gave the recording industry two of its greatest achievements — the introduction of magnetic tape recording and the 33 1/3 LP, or long-playing record. Now with our 45 RPM release, the best-sounding version of this historic album gives listeners an even richer sonic experience. The dead-quiet double-LP, with the music spread over four sides of vinyl, reduces distortion and high frequency loss as the wider-spaced grooves let your stereo cartridge track more accurately. Four years. That’s all it took to go from the discovery by Americans, of German advancements in the field of sound recording, to the marketing of tape decks in the U.S. by the Ampex company, to Columbia’s unveiling of its 12” LP, and the first long-playing record to be sold to consumers. The four selections contained here catapulted the Maestro Ellington into the LP era, as the great composer/arranger/pianist and his matchless orchestra took full advantage of the possibilities afforded by magnetic tape recording and the still-new 33 1/3 RPM LP to, for the first time, capture uncut concert arrangements of their signature songs. Duke was joined for this album by a virtuoso supporting cast: Duke Ellington, Billy Strayhorn (piano). Russell Procope, Paul Gonzalves, Johnnie Hodges, Jimmy Hamilton (saxophone). Nelson Williams, Andrew Ford, Harold Baker, Ray Nance, William Anderson (trumpet). Quentin Jackson, Lawrence Brown, Tyree Glenn (trombone). Mercer Ellington (horn). Sonny Greer (drums). Wendell Marshall (bass). Yvonne Lanauze (vocals). This album wouldn’t have been possible without a chain of events starting at the end of World War II. Recorded in December 1950, just five years after Germany fell to the Allies, revealing the Germans’ advances in magnetic tape recording, Ellington’s master work holds its wonder still today and the recording quality hands-down betters the sound of many modern-day albums. 1944-45: Magnetic tape for sound recording spread to America after an American soldier, Jack Mullin, serving with the U.S. Army Signal Corps in the final months of WW II, received two suitcased-sized AEG ‘Magnetophon’ high-fidelity recorders and 50 reels of Farben recording tape that had fallen into American hands via the capture of a German radio station at Bad Nauheim. German engineers had perfected the technique of using Alternating Current bias — the addition of an inaudible high-fequency signal (from 40 to 150kHz) — to improve the sound quality of most audio recordings by reducing distortion and noise. 1947: Mullin became an American pioneer in the field of magnetic tape sound recording, after working to modify and improve the machines. He gave two demonstrations of the recorders at Radio Center in Hollywood in October 1947. A later demonstration for singer/entertainer Bing Crosby led to the use of magnetic tape for recording Crosby’s radio programs. Crosby became the first star to use tape to pre-record radio broadcasts. 1948: Crosby invested $50,000 in local electronics firm, Ampex, and the tiny six-man concern soon became the world leader in the development of tape recording. Ampex revolutionized the radio and recording industry with its famous Model 200 tape deck, developed directly from Mullin’s modified Magnetophones. Units marked serial No. 1 and 2 were delivered in April 1948 in time to record and edit the 27th Bing Crosby show of the 1947-48 season. A 200A at the time retailed for $4,000 — nearly as much as a standard single-family home. Crosby gave one of the first production tape decks to musician Les Paul, which led to Paul’s invention of multitrack recording. The first production model 200A recorders are delivered to ABC and placed in service across the country. This marked the first widespread professional use of magnetic tape recording. Working with Mullin, Ampex rapidly developed 2-track stereo and then 3-track recorders. Mullin and Ampex developed a working monochrome videotape recorder by 1956. Here’s where it gets really interesting, as The Duke and history made matchless audiophile magic. In 1950, two years into the LP era and the transition from disc to magnetic tape recording, Columbia Records got Duke Ellington and his orchestra into the studio to cut a long-playing record. The Columbia 30th Street Studio opened in 1949 and Masterpieces was one of the first recordings done in the studio! June 1948: Vinyl LPs had taken over as the standard for pressing records by the 1940s; in 1948 Columbia Records introduced its 12-inch Microgroove LP or Long Play record, which could hold at least 20 minutes per side. The first classical long-playing record, and the first 12″ LP of any kind— catalog no. Columbia Masterworks Set ML 4001— was Mendelssohn’s Concerto in E Minor for Violin and Orchestra, Op. 64, played by violinist Nathan Milstein with the Philharmonic Symphony Orchestra of New York, conducted by Bruno Walter. December 19, 1950. 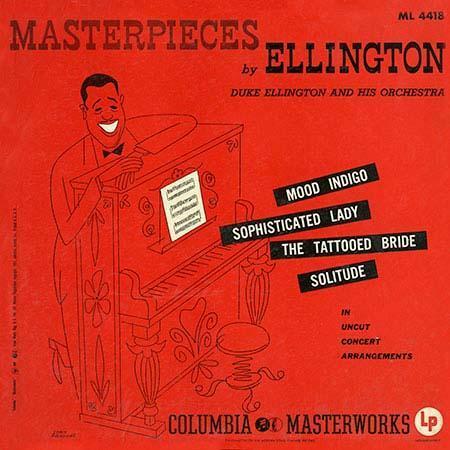 Masterpieces by Ellington recorded at Columbia’s 30th Street Studio. Released in 1951. Recording engineers Fred Plaut and Harold Chapman. Recorded on an Ampex 200, using 3M-111 magnetic tape running at 15 inches per second. (3M-111 tape was also introduced in 1948, the year the Model 200 debuted). Columbia Records transformed the former church (the Adams-Parkhurst Memorial Presbyterian Church, dedicated in 1875) into a recording studio in 1949. The studio had 100-foot high ceilings, a 100-foot floorspace to record, and the control room was on the second floor — a tight fit at 8×14 feet. It was later moved to the ground floor. Suddenly, for the first time in his career, Ellington was able to forgo the 3 minutes-and-change restrictions afforded by the short running time of the 78 RPM disc. He and his band rose to the occasion with extended (11-minute plus) ‘uncut concert arrangements’ of three of his signature songs — “Mood Indigo,” “Sophisticated Lady,” with evocative vocals by Yvonne Lanauze, as well as “Solitude.” Masterpieces was also notable for the debut of the full-bodied, surprise-laden “The Tattooed Bride,” and for the swansongs of three Ellintonian giants of longstanding: drummer Sonny Greer, trombonist Lawrence Brown and alto saxist Johnny Hodges (the latter two would eventually return to the fold). Masterpieces is a revelation and a throwback to a golden recording age. So much history and so much luck combined make this album truly special.